Cascabel ready to strike at bats disturbed by our entry into the cocoa house. We recently acknowledged what appears to be the permanent status of a new arrival at Spring Hill. 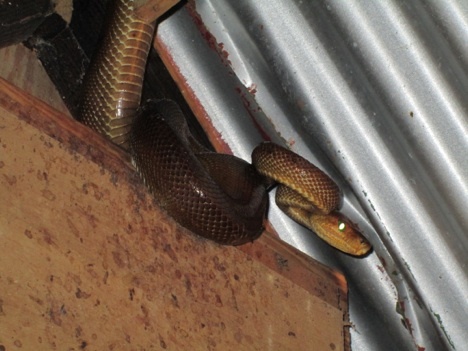 A beautiful large Cooks Tree Boa, (“Cascabel” in local parlance) seems to have taken up residence in one of our cocoa drying houses. returning inside. It has been seen striking at the bats which share the cocoa house, so we believe that it has no reason whatever to move on. This cocoa house practically abuts the new photographers’ Blind which we have just opened, so both the Cascabel, and its chosen diet of bats are on hand to “pose’ for the photographers who wish to capture them on film! And for those of you who really do not like snakes—or bats!–, please do not be concerned. You will not see these creatures on your visits to Spring Hill unless you ask to be taken to the cocoa house! 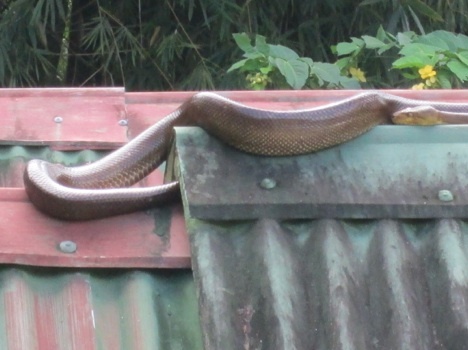 The same snake enjoying the sun on top of the roof, note the head turned back into the picture.